What a great combination! Enjoy Wild Huckleberry Jam & Wild Huckleberry Honey in this hand crafted custom crate. 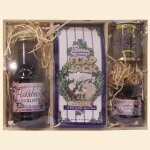 Includes Wild Huckleberry Coffee, Jam and Syrup as well as Huckleberry Almond Flap Jack Mix. Hand crafted custom gift crate makes a perfect holiday gift.